Notice the assumptions. First, that CO2 emissions are “the main cause of global warming.” Nowhere in the story will you read a hint that legions of scientists dispute that claim. Nowhere do you read that many global warmists concede CO2 is but a trace atmospheric gas and its influence on temperature pales in comparison with that of water vapor. And of course not a clue is offered in the story that the sun probably is responsible for any fluctuations in global temperature far more than anything else. These facts are not even on the reporter’s radar, obviously. Oh yeah, don’t forget the assumption that the globe is warming to a dangerous degree, which is implicit in all these scare stories. Why else write them? If it were not viewed as something dangerous do you think the reporter would bother? “Something is going on that has no important effect” is not a story line in any news report. Also, notice that the story cites as the authority on this matter, the European Commission. Do you read anywhere in the story anything that might suggest a motive for the commission advancing such a questionable claim? Nope. Nowhere is it mentioned that the prime motivation of the cap-CO2 crowd is a hoped-for tax on emissions. Gee,why would government bodies that are starved for more money want to advance such a theory? An inquiring reporter might ask, or at least want to know. Not in this story. Instead, the claim is advanced as if it is indisputable, neutral and without sinister motive. What thinking person believed this to be an appropriate photo for a story about clear, colorless, INVISIBLE CO2? 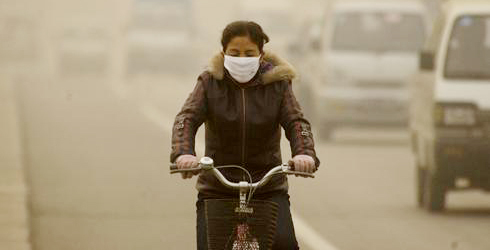 And where on earth do people wear masks to protect themselves from CO, which by the way they exhale with every breath? Conflating this scary picture of some apparent noxious atmospheric pollutant with the issue of global warming and CO2 emissions is just flat out fraudulent. But let’s give USA Today the benefit of the doubt. They have so swallowed the Kool-Aid on this manifactured faux crisis that normal news judgment and standards have ceased to apply.